Trephining or trepanation is a procedure where a hole is cut through the skull, exposing the dura mater, the outer covering of the brain. Modern medicine uses the procedure in head injuries to relieve pressure from fluid or blood build up or to insert monitoring devices. Perhaps surprisingly, operations on the scull to treat skull fractures, diseases of the skull, and to release evil spirits have been conducted since pre-historic times. The drilling instrument known as the trephine was first described in the 16th century. An improvement on earlier technologies, the trephine had interchangeable perforators or circular saw bits. A centre guide pin was lowered to direct the instrument for the initial sawing and raised and locked with a screw button on the shaft to prevent injury to the brain during the procedure. 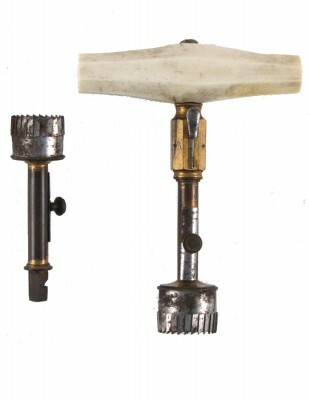 This pair of crown trephines has a removable ivory handle. They were used by Dr. G.S. Herod, who was licensed to practice medicine by the Medical Board of Guelph, Ontario in 1847.